A Dutch Canopy will be a great addition to your garden and is a great looking solution that will shield you from all four seasons. Here at Regal Awnings, we offer a wide array of Dutch Canopies designed with the highest quality materials for you, the customer. All of our Dutch canopies are designed specifically for your home, no matter what shape it may be. With three hundred variations of fabrics, you can be sure that you’ll be spoilt for choice when it comes to finding the right material for your Bespoke Dutch Canopy to match your home exteriors. Here at Regal Awnings, we pride ourselves on offering you, the customer, the widest range of options possible for your own garden feature.In addition to the large variety of coloured fabrics, we have a range of manual, fully automatic and electric operation canopies. Decorating a Dutch canopy can be difficult, with such a wide range of different variations to choose from. That’s why our in-house team are ready and waiting to help you pick the perfect Canopy! Do not hesitate to get in touch with us today! Our staff will be delighted to advise you on any questions you may have and will help you choose the right canopy for your home! 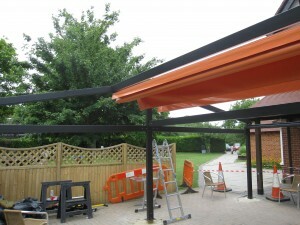 We even have a team of specialist in house fitters that will ensure your garden canopy is fitted correctly and securely in the quickest possible time, to allow you to enjoy your new canopy straight away and make the most of the sun!